As we speed into 2019 while reflecting upon our achievements in 2018, I would like to take this opportunity to thank our clients, partners and our talented teams across the globe for what has been a very successful year for Volante. We have welcomed several new clients and to highlight just one of our key strategic initiatives, we launched our ‘Payments as a Service’ on the cloud with our first client - you can read more about such initiatives in this newsletter. Achievements and additions aside, 2018 marked the year in which we further increased our role in helping many financial institutions accelerate their digital transformation in payments processing. We anticipate that 2019 will see yet more banks coming to Volante for support in this area of growth. The Volante ecosystem of business services is proving to be the ideal answer for supporting rapid and transformational payment projects for banks. Included in this edition is Neil Clarke’s market insight and an article kindly provided by Chris Fritz, Principal Consultant at Ulfberht Advisors discussing the important subject of Client Experience improvement. Other highlights include Fiona Hamilton’s interview with The Sunday Times and Nadish Lad’s interview at SIBOS for Microsoft. You will also see mounting evidence of our focus in helping firms become PSD2 ready as the deadline looms - with QIB (UK) plc and Bank Leumi adopting Volante’s VolPay Open Banking solution to secure quick compliance with the European PSD2 directive. Before you read on, I would like to take this opportunity to wish all our customers, prospects and partners a successful 2019 and as always, I encourage you to get in touch with one of our team to arrange a time to speak - we welcome any thoughts or questions you may have. It’s rather a SWIFT and payments-focused update this month but in my view the only place to start is the very significant news released just prior to the SIBOS event in Sydney. It was announced that the MT messaging standard, that has for decades underpinned the SWIFT FIN network and dominated cross border payments, is now mandated to migrate starting in November 2021. Migration will focus on the well established formats such as MT 103, MT 202, MT 950 to name just a few, through to the XML ISO 20022 based formats of their equivalent messages such as the pacs.oo8. Following a wide consultation with banks, and wary of the expected impact of the change, this news is, however, to be welcomed. It brings SWIFT in-line with many of the regional and national payments infrastructures using ISO 20022, e.g. SEPA and a multitude of real time payments schemes, and will help enable greater interoperability when payment instructions move between domestic CSM’s already using ISO 20022 and the international SWIFT network. 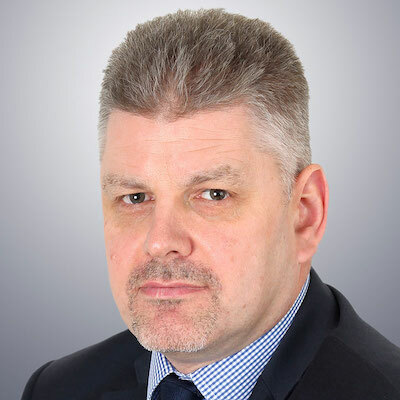 The EURO1 high value payments system has announced they will migrate from MTs at the same time and it is expected that the new UK payments infrastructure and RTGS system, as well as the US Fed, will similarly be using ISO 20022 messaging by this time. However, the format change, albeit happening in 3 years’ time, will no doubt provide a significant challenge to any bank using the SWIFT network, in particular those banks that remain encumbered by legacy technology and applications bound to the now over 40 years old, MT format. Though some larger banks are beginning to adopt the ISO 20022 formats in conjunction with larger corporate clients (appreciating the richer data the format provides particularly in account reporting - see the CGI-MP community for example), it is still not a well adopted format for cross border transactions. This move will of course change this. Banks must decide if they will take this opportunity to overhaul their infrastructure or quite likely create a flexible “insulation” layer in their environments to transform seamlessly between the formats to minimize the impact such as handling not only the mapping between the formats but also supporting the challenges of an inherently asymmetrical process where ISO 20022 can contain much richer and detailed information than the MT standard. This is a challenge that Volante has been successfully assisting our banking and corporate clients with for many years. There is no doubt that there will be upfront costs involved in this migration but it is a testament to the increasing adoption of the ISO 20022 standard in the payments domain, that in the feedback to SWIFT’s consultation document, when asked the question “Does the combination of drivers justify a migration of cross border payments to ISO 20022?” 97% of financial institutions responded in the affirmative. However, it is not only pure payments applications that will be impacted. Many banks’ in-house and 3rd party vendor applications that initiate/consume/process payments or account information, e.g in the post-trade space, or Corporate ERP/TMS solutions, will need to address this change. Similarly, this could be the opportunity to re-architect products to adopt an ISO 20022 canonical data model, or potentially integrate components from specialist suppliers likes Volante to deliver the compliance needed. More news in the payments world sees the continued push of the SWIFT gpi solution with the service reportedly now tracking 80% of SWIFT end-to-end payments, across more than 300 participant banks. With mandatory processing and addition of the UETR from November 2018, SWIFT has now launched a universal tracker for all SWIFT banks (gpi members or not) and of particular note G4C – gpi for Corporates – a tracker designed for corporate treasury. With the continued advancement of the service it is now time for banks to start to differentiate their SWIFT gpi service offerings to corporate clients and in turn, the beneficiaries of B2B payments. For example, linking SWIFT gpi payment tracking to supply chain payments/trade financing solutions could create distinct new competitive offerings. 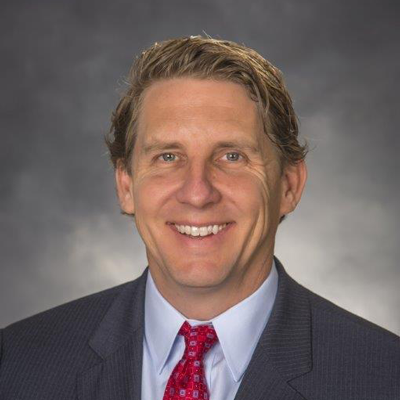 Chris Fritz, formerly of SunTrust Bank and JP Morgan, now Principal Consultant at Ulfberht Advisors. Authored by: Chris Fritz, formerly of SunTrust Bank and JP Morgan, now Principal Consultant at Ulfberht Advisors. The above categories are broad, taking a narrower view of commercial mobile applications from 5 large US banks as described by their publically available marketing materials, there seems to be a pretty consistent offering of mobile services across all 5 of the largest US banks. How do banks deliver their services? We are a long way from 2004 when the internet was still a mystery to commercial clients. Clients are now savvier and a digitally-based relationship should in theory mean it is easier to transfer that relationship. How then might banks differentiate in a crowded market where clients and relationships are mobile? This led me to consider how such banks ultimately claim ‘uniqueness’. To achieve this, I looked at the offerings at 12 large US banks. The results were similar to what I saw for mobile capabilities: commonality. Indeed, 11 of the 12 banks touted their ability to bring experts from across their institution to bear on a client’s particular needs which would result in a bespoke solution that would elevate their business. So, if banks offer roughly the same services, and have similar marketing messages, how can they distinguish themselves? 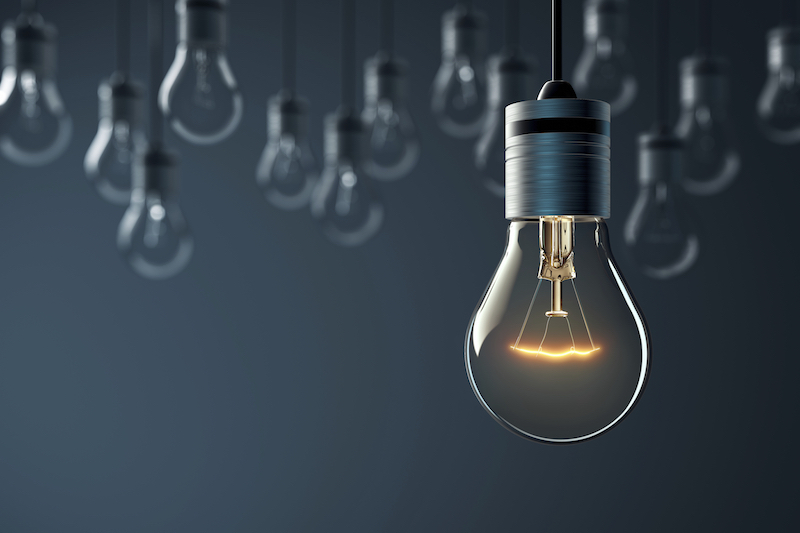 Can innovation truly help banks to think differently and distinguish themselves? If you are familiar with Danny Meyer, the Founder of Shake Shack, you might have heard him talk about the role of innovation in long term relationships: “Shelf life of innovation today is 2 minutes. So we need to do the pleasurable thing. How does it make the client feel.” - Danny Meyer, CEO of Union Square Hospitality & Founder of Shake Shack. Most people, in a banking context, don’t refer to a “pleasurable experience”, but we can translate Meyer’s message to mean - if you create a positive experience for your client, they won’t want to leave and will shut the door to the competition. Are products built and delivered in a way that makes them indispensable to the client? Does the Treasury staff rely on the bank for key steps in their daily process? Do those steps increase or decrease efficiency (happiness)? Do we have a truly differentiated industry expertise? Are we an international or domestic bank? Can we position ourselves as a payment leader? When a bank develops a set of honest answers to the above questions, they should be able to structure their offerings to accentuate strengths and work around weaknesses leaving them to sell the services they do best, whilst backstopping weaknesses to minimize client pain. High- bank is actively seeking credit exposure and offers many types of credit products. Banking is a crowded, fairly commoditized marketplace. Any bank can mimic its competitors’ product suites. However, those that take to time to understand their clients and themselves, have an opportunity now to deliver their strengths directly into a client’s workflow. That’s the holy grail. If you can please the user in the accounting, finance, treasury department, that user will fight tooth and nail to ensure their boss doesn’t change banks just because a shiny new bell or a slightly lower price is offered. Because they’re getting a customer experience they cannot bear to leave. Early in October, Volante announced that QIB (UK) plc selected Volante Technologies’ PSD2 Open Banking solution. Building upon Volante’s partnership with Token who provide PSD2 compliant APIs, Volante’s Open Banking solution delivers a complete out-of-the-box solution for handling complex processes related to PSD2 regulation. The second announcement in October, was around the launch of Volante’s Payments as a Service for FIMBank. Volante’s well established VolPay Suite of payments processing products, launched VolPay-as-a-Service on Azure with its first customer bank. The service provides banks with a managed service for end-to-end processing of payments on the cloud, from capture through to clearing. FIMBank Malta will be the first bank worldwide to deploy Volante’s Volpay-as-a-Service on Azure, and important step forward for cloud-based payments infrastructure. Volante’s third announcement in October was the release of Designer 6.0 to deliver enhanced support for API banking, cloud enablement and microservices architecture. According to research from Aite Group, several trends are shaping the market and the ways in which leading technology providers must serve their clients. Trends include a focus on customer experience over functionality, improved data delivery, more frequent product releases, fully API-enabled architectures, and plans to create financial technology ecosystems. Volante has seen a real appetite in Latin America in 2018 for the VolPay Suite of payments products, and in response has released its popular VolPay Hub: RTP Suite and VolPay Suite for payments videos in Spanish. In an article by FinOps Report on CSDR headaches, Fiona Hamilton, Volante’s Research Director, talks about how Volante is helping to define changes to existing messages in order to correctly map the information on internalized settlement instructions to the format ESMA requires. In September, Nadish Lad, Volante’s Global Head of Payments Products, shared his views with NGDATA on the single biggest benefit that digital transformation delivers for banks. In September, Fiona Hamilton talked to Joe McGrath for the The Sunday Times’ regtech for capital markets report on how disruptors looking to enter capital markets face an enormously complex environment. Today, receiving and providing accurate data, is king. Today, receiving and providing accurate data, is king. But rather than firms searching for more data, they are now looking at how best to store, access and manage existing data. How can you tap into your data lake to not only meet regulatory requirements, but to also start innovating by applying that data in new and interesting ways? Catherine Kavanagh, Sales Director for Volante, explores this topic in more detail in a blog post for Finextra. In this Sibos interview with FinTech Futures, Volante's CEO Vijay Oddiraju discusses how cloud-based payments-as-a-service has entered the mainstream, and what benefits it brings to banks. 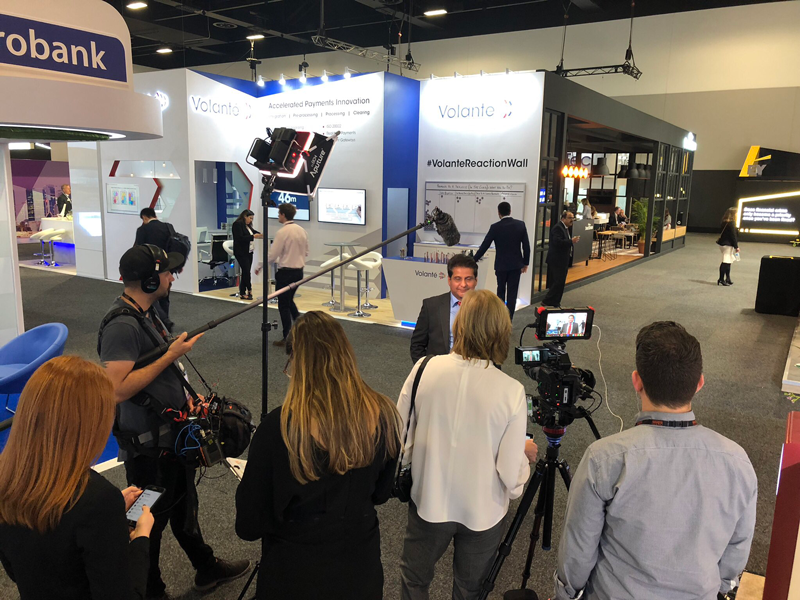 In a second Sibos interview with FinTech Futures, Volante's Global Head of Payments Products Nadish Lad looks at the future of Open Banking and APIs and how banks can improve the customer journey. Fiona Hamilton authored one of ISS-Mag’s most downloaded white papers of all time titled ISO 20022 – A simple guide to a complex subject – Considerations for ISO 20022-based data integration. Given the progress in global adoption over the intervening years, we felt it was timely to revisit the topic and update the paper taking into account developments since the previous edition - which is now available for download from ISS-Mag. In this Microsoft Cloud interview at Sibos, Nadish Lad discusses how the future of payments will be defined by various initiatives that improve the customer experience such as real-time payments, Open Banking and SWIFT gpi. There is significant innovation and competition afoot in the world of payments initiation, driven by consumers and corporates on the demand side, and traditional banks, fintechs and challengers on the supply side. Real-time / instant payments, blockchain and distributed ledger - new solutions to the old problems of cross-border correspondent banking - plus other initiatives all have the potential to transform how payments are processed, cleared and settled. We explored this topic in more detail in a jointly prepared white paper with Finextra. In November, Nadish Lad was interviewed by The Paypers on the challenges banks face when implementing Open Banking strategies, and how they can generate new revenue streams on the back of these initiatives. Also in November, Fiona Hamilton was once again interviewed by FinOps for a feature on Europe’s CSDR: New Settlement Fines, New Ops Strains, where she discussed the challenges around transforming ISO 20022 messages into ISO 15022 message types. Lastly in December, Vinay Prabhakar Volante’s VP of Product Marketing, discussed the progress of real-time payments in 2018 and its future outlook in an article for PaymentsJournal. In September Volante exhibited at the SWIFT Middle East Regional Conference in Dubai. 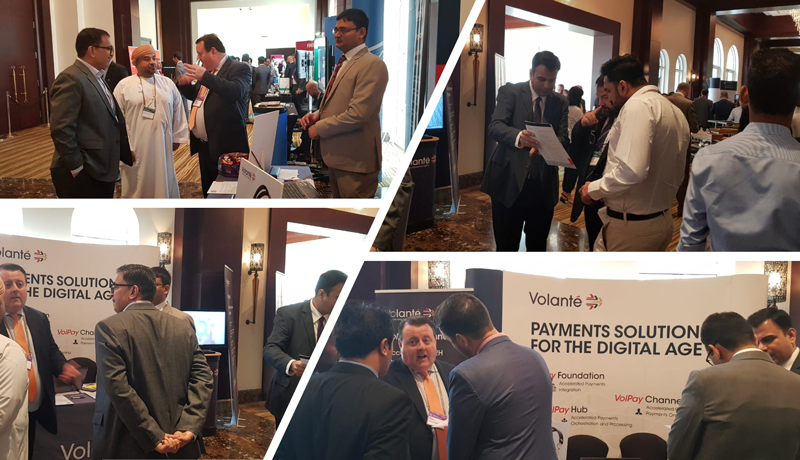 There were plenty of interesting conversations around how firms can take advantage of opportunities in digital payments processing in the Middle East. That same month, Volante exhibited at the CLAB 18th annual Financial Technology & Innovation conference in Colombia. Conversations centered around the impact of Blockchain in the financial ecosystem, and its wider implication for financial services in the LATAM region. 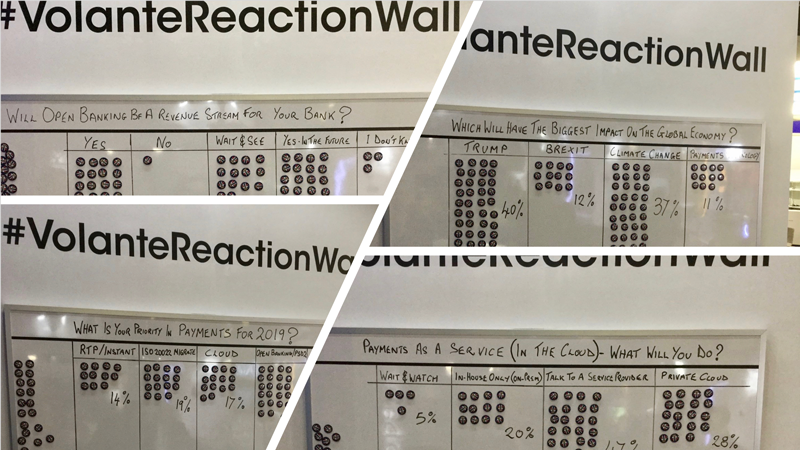 Volante also brought back the popular #VolanteReactionWall, which included some interesting results thanks to some tantalizing questions for which conference delegates voted with responses capturing the mood of the occasion! On November 20th, Volante sponsored the Finextra NextGen Banking Nordics event in Stockholm. Domenico Scaffidi, Volante’s Business Development Director, participated on a panel discussing the finer points of Open Banking and Real Time Payments. On November 22-23, Domenico once again took to the stage at the Annual International Payment Forum in Vienna, to discuss the current state of instant payments and potential developments going forward. On November 29-30, Volante sponsored and spoke at the GFMI: Digital Transformation in Transaction Banking event in New York City. Vinay Prabhakar participated in his first official speaking panel as Volante’s Vice President of Product Marketing. In December, Vinay spoke at two more events. 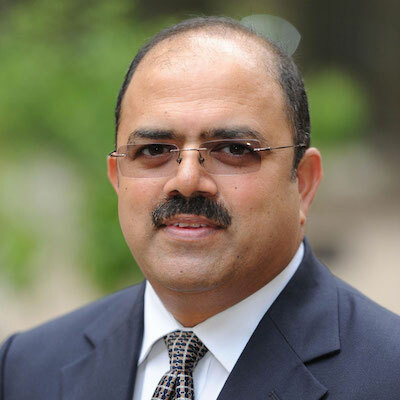 On December 10, Vinay presented on US real-time payments as part of an Aite Group roundtable. The next day, December 11, Volante sponsored Aite Group’s Innovation in Cash Management and Payments Forum. Vinay spoke on a panel discussing the risks and rewards of innovation in the financial industry. 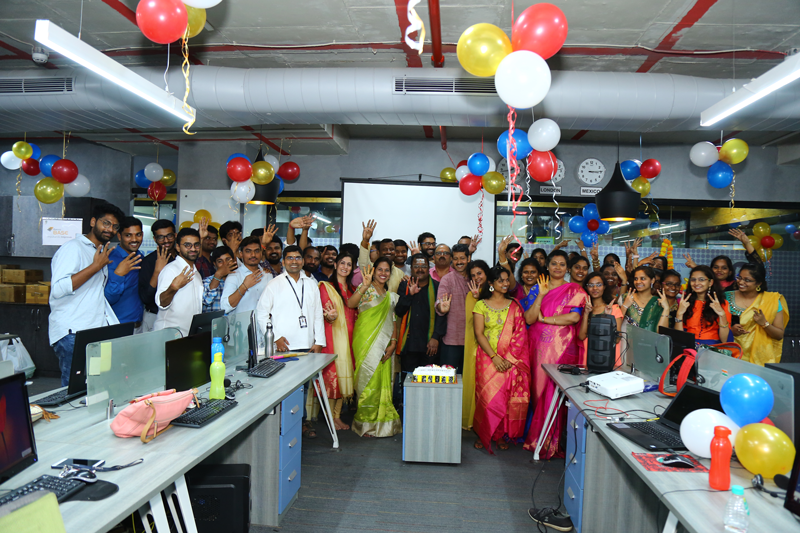 Volante in Hyderabad one of three of its regional offices in India, celebrated its 4th anniversary on October 12, 2018. People were greeted as soon as they arrived with beautiful decorations throughout the office. The senior management team along with Volante’s CEO Vijay Oddiraju, started the day with a traditional warm welcome to all staff and guests. The ceremony was led by Vijay and his family who illuminated the event by lighting the holy lamp followed by a traditional prayer for the success of the business to date and in the years to come. 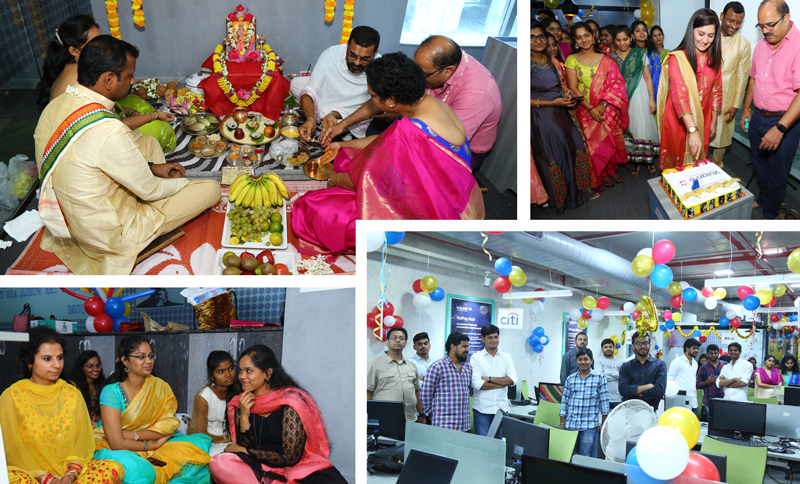 This was then followed by a visual presentation of our journey at Volante Hyderabad and a series of felicitations from Vijay Oddiraju, CEO, Girisha Neeraje, Head of India Operations, Surendar Elagandula, Senior Director - Business solutions, and Mirunalini Mothilal, Head of HR India. The day continued with a sumptuous business lunch which all joined, followed by a traditional Dusshera Dandia, fun games and lot more of entertainment. Indeed it was a most memorable day in our calendar of celebrations!